Looking for that afternoon oasis where you and your friends can unwind and relax with good food and drink? 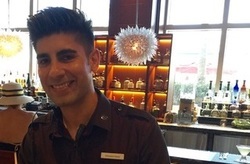 Jay, Jordan and the friendly team at the 3800 Ocean Lounge at the Singer Island Marriott will make you feel right at home. Happy Hour is Monday-Friday from 5-7 p.m. House drinks are buy one, get one free and food items off the Lounge Menu are half-off. Our favorites include the Parmesan fries, the local catch fish sandwich and the grilled chicken breast "pretzel club." The mango guacamole isn't bad, either. Related: The Peppermint Patty -- a holiday cocktail. When Damon Runyon penned,The Lemon Drop Kid, who knew there would come a time when that moniker would conjure up an entirely different image than the one in his short story? With apologies to Mr. Runyon, I do think of his title when I see a creative mixologist conjure up magic in a cocktail shaker at 3800 Ocean at the Singer Island Marriott and Spa. Read more. 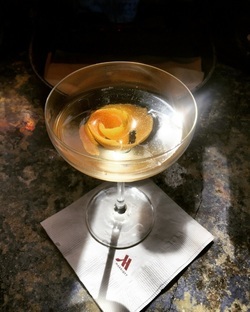 The White Rose is a very summery, springtime cocktail. It has gin, St. Germaine elderflower liqueur, blood orange bitters and a grapefruit zest. The liqueur is made from elderflower, a small, white starry flower that blooms through the spring and summer. It has a very floral taste with hints of pear and lychee. I usually have people smell it. When they do, they're sold. Basically combine 1 1/2 oz gin, 1oz. St. Germaine elderflower liqueur, two dashes of blood orange bitters, and peel the skin off the grapefruit, roll it into and a cylinder and run it on the rim of the glass. Then when you drop it on the glass, the skin of the grapefruit zests and creates more flavor. And it looks like a rose. Hence the name. MARRIOTT GETS MAKEOVER. 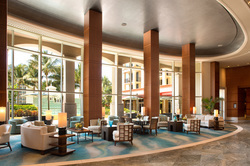 The Palm Beach Marriott Singer Island Beach Resort & Spa has officially unveiled the results of a $6.8-million renovation, first noted in our interview with GM Roger Amidon. The new look "blurs the lines between indoor and out, bringing ocean-inspired colors and textures in, while encouraging guests to step out and enjoy the fresh air and beachfront setting." MEET GIOVANNI ISAZA. Working diligently behind the scenes to help insure things are clicking like, well, clockwork, are the more covert cogs. The staff, so efficient, they make it all seem effortless to the customers. So, from backstage, we pull Giovanni Isaza, Food and Beverage Supervisor, into the spotlight of center stage. EASTER DINING AT 3800. Looking for Easter dining options? Singer Island’s oceanfront restaurant --3800 Ocean -- is offering three of them on Easter Sunday, March 27. SUPER BOWL SNACK IDEA. 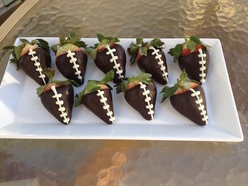 Try these chocolate-covered strawberry footballs from the Marriott's executive pastry chef. TASTE OF ITALY UNDER THE STARS. 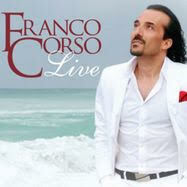 The Singer Island Marriott is hosting a special "Taste of Italy Under the Stars" dinner Feb. 6. More details here. 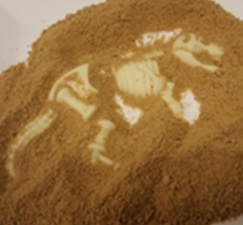 DINOSAUR TRAVEL PACKAGE. Palm Beach Marriott Singer Island Beach Resort & Spa is providing prehistoric family discovery with its new “Dinosaurs Around the World” travel package in collaboration with the newest exhibit at the South Florida Science Center and Aquarium. ​12.10.15. 5-ft. Gingerbread House. (Press Release) Palm Beach Marriott Singer Island Beach Resort & Spa has completed the ultimate holiday feat – a five-foot-tall edible gingerbread house to sweeten the holiday season. 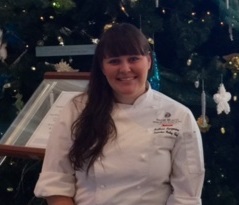 Perched in the lobby next to the resort’s nautical-themed Christmas tree, the impressive house, designed by Executive Pastry Chef Brittani Szczecina and team, took more than 280 hours to complete. Built entirely from edible materials, guests have already begun posting their Instagram-worthy selfies with the massive candy covered confection. On Monday, Dec. 14, Palm Beach Marriott Singer Island’s Facebook page will launch “10 Days of Giveaways,” giving fans the chance to win everything from a box of truffles to an overnight stay based on questions about the gingerbread house. The fan with the closest guesses combined with the most number of tags will win a prize.